The NTAG213 on-metal label is designed to be attached on a metal surface, utilising specially designed shielding to allow continued contactless use without interference. This NFC label is a 29 mm diameter, circular sticky label that operates at 13.56 MHz wireless frequency and contains 137 bytes of usable read/write space for NDEF data. Based on the NTAG213 chip from NXP, this label offers advanced security, anti-cloning features as well as a permanent lock feature, therefore user data can be permanently configured read-only. The NTAG213 NFC chip features improved performance and is fully compatible with MIFARE Ultralight C.
This sticker is NFC forum type 2 compliant and typically operates at a distance of up to 5cm depending on the power provided by the NFC enabled device. 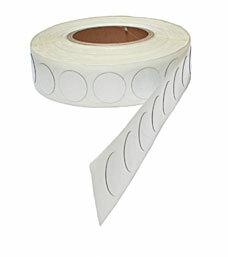 Supplied as plain white self-adhesive plastic labels. We offer various NFC encoding, printing & customising services - please contact us for details! Contactless MIFARE Classic tag for use on metal surfaces. 1K byte of memory. Operates at 13.56 MHz. 45mm x 30mm x 3mm.